Swordarm » Audacity, Blogitorial, Civil Military Relations, Military » Internal Deficiencies? A positive view of the emotional outpouring of the officer is that such feeling of loyalty and ‘josh’ for one’s outfit is an extremely good sign. Pride for one’s unit and organisation is a prime attribute that one would look for in junior leaders of a fighting force. He has also displayed a degree of audacity – another quality sought after in such leaders – in violating the norms and channels through this missive, as also having the moral courage to sign it with his name rather than sending it anonymously. One hopes that for these reasons, his indiscretions will not invite more than a rap on the knuckles by his superiors for what is probably a misdirected display of loyalty. The disturbing part of this newspaper report, however, are the statements that the letter has “touched a chord with the CRPF rank and file” and “majority of the CRPF officials agrees with the assistant commandant”. As per the news item, the chief’s statement has had a “demoralising effect on the force”. This can have two interpretations – that either they do not agree with the Chief’s assessment that ‘internal deficiencies’ exist, or that while they agree that deficiencies exist, the Army Chief has no business to talk about them. The latter has already been talked about at length in a previous Blogitorial entitled ‘Silence of the Lambs’. So what about the internal deficiencies? A number of newspaper reports based on interactions with CRPF men on the ground tell tales of glaring apathy by the government and the force’s own hierarchy towards the troops deployed to tackle what is termed as the ‘biggest internal security threat’. “Why are we being tortured” is one such report from Times of India. The reporter in question visited the CRPF camp at the site of the massacre, and has been receiving calls from the CRPF men there since. “…being posted in Dantewada is worse than getting killed by Maoists. We have to walk 50 km to buy something as trivial as a matchbox. There is no gas cylinder for us to cook food—we have to pick firewood. Does the government even bother about us?” one soldier told the reporter. “We have no water, no proper food, no medicines—why are we being tortured like criminals? Please get our voices heard in Parliament. You are a journalist after all,” was another plea. Obviously, the troops in question have bigger reasons to be demoralised than remarks of the Army Chief about internal deficiencies within their force – even if they did have access to a newspaper, or the time to worry about such distant events. Report of the enquiry conducted by a former DG of the BSF into the Dantewala massacre has been submitted to the government. While it has not been made public as yet, newspapers say that the report indicates ‘leadership failure’ and lack of coordination between the force and local police were the major causes. If the remarks made by the Army Chief have disturbed the inner soul of the Assistant Commandant in question, and possibly that of a large number of his brother officers, one wonders what effects reports about such apathy and deficiencies would have on them. There is a lot of truth in his assertion that every organisation has its merits and deficiencies. But it is also true that acknowledging these deficiencies does not mean that the organisation itself is being castigated. In fact, accepting any such shortcomings and taking assertive action to overcome them is what actually contributes to its strengthening. The Army itself has been guilty of attempting to brush a number of infirmities under the carpet or trying to ignore them. But in a larger number of cases, it has proved itself capable of acknowledging mistakes and taking corrective action – the latest instance being the removal of two COs in the valley for failure to prevent human rights violations. For a force to be reckoned as a truly professional outfit, it is necessary for it to be ruthless in introspecting on its own shortcomings and dealing with them positively. This is a lesson that needs to be learnt urgently by forces involved in anti naxal operations and other internal security duties to ensure incidents like Dantewada are not repeated. 8 Responses to "Internal Deficiencies?" While I argee to all the points put forth in the discussion, I would want to argue on one major issue & that pertains to the most important facet of any military or paramilitary outfit & which without doubt is TRAINING, the question is; why cant the training be real & related to the situation, the fact that most of the army jawans ( & qite a few officers) fighting in Kashmir don’t have its history clear, infact they have started behaving as if they are a part of an occuaption Army. 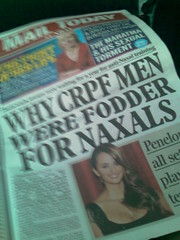 So is the case in the anti Maoist drive, the aim itself is not clear to most. The second most important thing is INTELLIGENCE, that is always found wanting. Why dont we plan on seeing anything before attacking it? Why can’t we effectively create a int network, a brigand as small as Veerapan couldn’t be handled just due to lack of intelligence. If there is TRAINING & if there is INTELLIGENCE, MOTIVATION is bound to flow. What else does one need, more than a motivated force ! All three factors jelled in success is sure & success will further raise the morale of any force. @Jaiwant – you are absolutely right. But for these things to happen, you need coherent thought process and continuity in policy at the apex levels. As for educating troops on the history / genesis of the problem, that is something that can be done at unit / formation levels. But at each level the approach is more of firefighting than problem solving. Then again, I think we are not alone in this – even the US has faltered in Iraq and Afghanistan when faced with insurgencies resilient to high tech. US faltered because they went in wrongly into Iraq since they were not wanting to disturb there interests in the CAR ( Central Asian region ) more because of the business interests of senior Bush. Later they have gone in to fight their own frankestein monster…..what else can you expect. Our own case is much different & needs handling ASAP. If we keep fighting fires they will leave sparks somewhere everytime ( case in point is the Golden temple , where Beant singh’s photo is placed as a martyr in the Gurudwara museum & no one want to commen) we will wait only to douze another fire. i wonder what you are going to tell that CRPF asstt comdt who wrote to chief of Army.There are black sheep in CRPF itself who are selling ammo and weapons to Maoist.I am sure some body in CRPF must have instigated him to write trash.An enquiry must be ordered by CRPF to investigate in the circumstances of writing such letters and deception plan to divert attention from internal short comings ,which are now coming out in open. @Shuks – It would be fair to take the youngster’s letter at face value rather than blow the issue out of proportions. Personally I would ascribe it to a misdirected sense of loyalty to one’s organisation. Don’t we see it all the time in all organisations and at all levels – trying to cover up our mistakes and lapses, sometimes even serious ones, out of such misplaced loyalty? Undoubtedly CRPF, like any other organisation, has its fair share of black sheep as well as dedicated, competent people. It has been thrust into a role that it is not very well prepared for so far. Therefore the focus of the organisation must be in preparing itself for the challenges posed by the new role. In doing so, weaknesses identified at any stage must be acknowledged and addressed – whether it is by better training, devising or adopting basic tactics suitable for the type of operations it needs to conduct, or by ruthlessly weeding out corrupt elements. Trying to gloss over these weaknesses by any means would only be counterproductive to the overall organisational interests, and, considering the criticality of anti-naxal operations, to national interests too. Well, the point remains – the training which plays a major role in all aspects military is lacking. Anything that suggests otherwise is misleading. Why only the paramilitary forces, the regular Army lacks training today. Ranting over the quality and the methods is merely paperwork or lipservice. I feel that the casualties toady can be considerably reduced by better training which also would include teaching the troops about the genesis of problems, history, demography etc. However this would be secondary aim, primary being to raise the effectiveness as a soldier. Now that would call for going back to the dictum ‘Train hard to fight easy’. Unfortunately, the time to train hard is being considerably by the administrative orientation of the average military psyche. This would lead to the regular army also suffering similar casualties as the CRPF did. Commenting is far more easy when there is a lack of will to hold the bull by the horse! Chief of Army Staff would not ever make a casual remark on such a serious issue. Asst Comdt should have avoided in his exuberance to be breaking a chain of command. He should have infact wondered as to why Army Officers get killeds inoperations–Because they fight together and lead the pack. It is important that CRPF counsels CRPF officer to know the correct procedure to initiate correspondence. Young man may consider that all significant leadership of CRPF is with IPS officials who may not have the orientation to showcase leadershp in an orgainsed attack. May be May be a relatively junior level Officer from Army will be able to provide better foresight and planning.